The Federal Security Series Bollard was designed as a perimeter defense system for high ranking personnel on Military installations. This security bollard system is designed to stop a 15,000-pound truck traveling at 55 MPH. 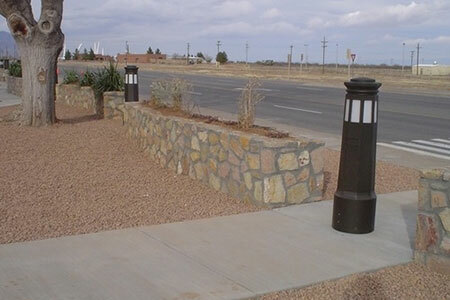 The General's Headquarters within the White Sands Base is completely surrounded by this bollard. Eight individual illuminated panels for walkways and also an unlit model as well. The security bollard system is comprised of a ten-steel pipe directly embedded and then concrete filled. The decorative security bollard slips over the top and is secured into place as a decorative cover piece with the added benefit of illumination.